Home » Expo » IMPORTANT – Detailed schedule for Experience Your Life Expo 29th Sep 2018! Are you READY for one of the largest empowerment events in Ontario on 29th September ? The first 100 attendees receive an awesome gift bag worth $50+. See pictures and videos from 2017 to feel the energy of this event. People are flying in from all around the world to be there on 29th Sep. WELCOME to Experience Your Life Expo! This post contains important information about the schedule, arrival time and breakout sessions at the expo on 29th Sep. Please review this in detail. Each year, our event is SOLD OUT – please come early to maximize the opportunity. We are also honoured to receive greetings and support from dignitaries such as the Prime Minister of Canada , and commitment to attend from several dignitaries,CEO’s, CIO’s, Executives and Commanding Officers. We have prepared 1 year for 1 day and that day is 29th September. 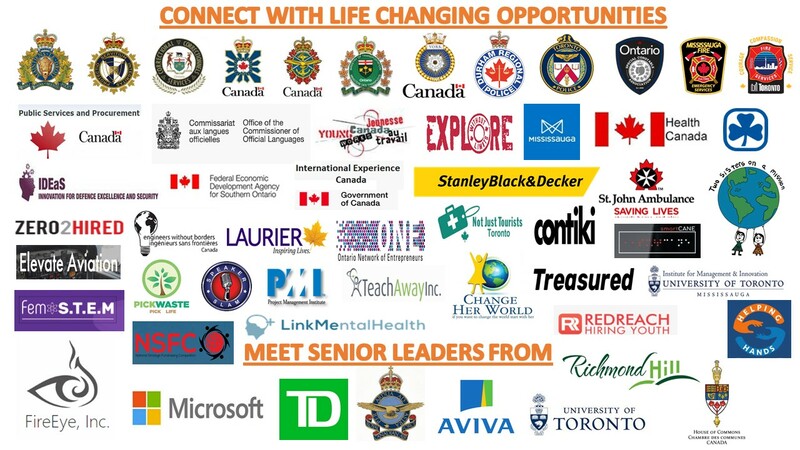 We welcome you to the event on behalf of our team of 70 incredible change makers that include police officers, professors, corporate executives, students, government officials and many more. Experience Your Life is dedicated to making a real difference in the lives of students and young professionals who are seeking to discover themselves and their passions while making a positive impact on the world. The Expo has grown to be one of the largest empowerment events in Ontario. We target a very specific demographic of positive change makers / risk takers who are seeking direction in their career. Please bring a printed copy of your tickets. We are going to be a sold-out event and this is required for you to enter the event. The location is Novotel Mississauga. Plan your commute to be there on time. Research the organizations and executives attending. This is truly an incredible opportunity so prepare well for it. Come early – the first 100 attendees get a gift bag of $50+ value. The Expo opens at 11 and the lineup starts at 10:30 a.m. or before. Please AVOID driving to the Expo and take public transit instead. The area around the hotel gets very busy so if you do decide to drive, please park in parking lots that are 3 to 4 minutes walk away (e.g. Square One) to ensure a smooth experience for your selves and others. For breakout rooms, please make sure you arrive early. There are only 9 spots per executive on the roundtable and they will be assigned on a first come first serve basis on the day of the event. This could be a life changing conversation with executives who are flying from across Canada and the world so don’t miss out. Plan your visit so you are there for a very special book launch at 1:00 p.m. for “Boy in the Library”. Last year, Sultan (Founder of Experience Your Life Expo) had launched a new project to build libraries around the world (www.libraryinaweek.com). Since that time, he has built 20 libraries in 7 countries. This book captures that journey and is a guide for anyone looking for inspiration to follow their dreams. We have a 100 people capacity for this session so signup early on 29th Sep! If you don’t have a breakout room ticket, you can still be on the waitlist. We will assign you a seat in case there is a cancellation or no-show. Again, showing up early is key. Main expo hall open to all attendees (tradeshow style format): 11:00 am to 3:00 pm. This room contains 50 incredible organizations. These include federal and provincial employers, entrepreneur accelerator zone, travel with purpose opportunities and many more. They are flying in from across Canada to be there for you. Make sure you do your research about them and come prepared with positive attitude to engage the leaders. Breakout sessions: As per schedule below. Parking: Paid parking at the Hotel (approximately 10 dollars) as well as complimentary parking at nearby Square One shopping mall. We highly recommend you take public transport to the hotel or park the car in Sqaure One Shopping Center or another spot a few minutes walk away from the hotel. The area around the hotel can get very busy. Accommodation (for out of town guests): There are a number of hotels in close proximity to downtown Mississauga including the Novotel which is where the event it taking place. Please approach the registration desk and present your ticket. Please sign up for the breakout sessions that you will be attending as it is on a first come first serve basis. Very senior executives and organisations are attending our event. A reminder that as per the conditions of your ticket absolutely no business solicitation is permitted. We strictly enforce this policy. Breakout room schedule: Real Leaders, Real Impact (the executives will stay briefly after their session to talk with general attendees. You may get a chance to speak with them even if you don’t have the breakout room ticket). 1:00 to 1:45: Sultan Akif’s book launch of “Boy in the Library” and First Nations Artist performance. It is available on Amazon here https://lnkd.in/dUf7kNY .Since the launch of the Library in a Week project last year at the Expo, Sultan has completed 20 libraries in 7 countries. This book captures the journey and is a practical guide for anyone looking for inspiration to follow their dreams. Visit http://www.libraryinaweek.com for details. Limited seating. Bring your positive energy and be ready to embrace life changing opportunities on 29th Sep. We work hard to attract a demographic that is positive, professional and ready to make a difference in their own lives and in the lives of others. We are making at difference at a global scale through our other project http://www.libraryinaweek.com. Check it out and join the movement of youth empowerment.